In case you were wondering, this is how things look for now in the first release of Scanbox 1.0. Click on the figure to get a larger picture. Here is a brief description of the panels. Chameleon: it allow you to change the laser wavelength, power and read out the laser status. Scanner: Defines scanning parameters including the total number of frames to be collected, the number of lines per frame, the magnification (x1, x2 or x4) or, instead of the number of lines one can specify the frame rate needed. Position: It allows you to control microscope position in (x,y,z) and tilt the axis of the objective (a-axis). You can zero the position and later return the microscope to the exact same position. The control is via a single ShuttleExpress controller. File Storage: Defines where the data will be stored, the subject ID, field # and experiment #. It also allows you to select which data channel you want to save (PMT0 – green, PMT1 – red, or both). PMT Control: It enables and controls the gain of the PMTs. Gains can be changed on the fly as the data are displayed. Camera Path: It slides a mirror that diverts the optical path into an IMPREX B2020M camera used to target a specified location or to perform intrinsic imaging through the same (or different objective). When the mirror is in place the images are displayed in the same image window now displaying the two-photon data. Two controls allow one to change the exposure and gain of the camera on the fly. Microscope control: It allows one to perform imaging in “focus” or “grab” modes. In focus mode the data are displayed but not saved, while grab will both display the data and stream to disk in real time. The numbers below will continuously update the number of frames collected and the time elapsed since the beginning of the acquisition. Image display: Allows the selection of the data one wants to display. Available options are to display the individual channels (PMT0 or PMT1), the channels fused with a red-green pseudo-color map, or display both channels side-by-side. 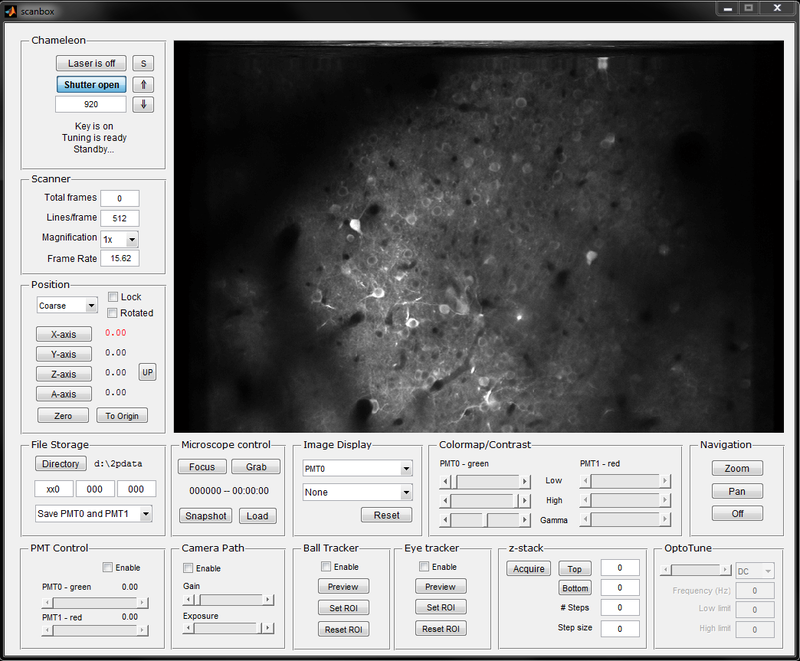 One can also perform on-the-fly averaging or taking the maximum of the images as they come in, and the accumulated/max image can be reset on the fly (for example, after moving the microscope to another location). Colormap/contrast: Controls the lookup table of the colormap used to display the data for both PMTs. Navigation: Allows on-the-fly digital zoom and panning of the image data. Note that this is digital zoom and will not change the scanning parameters. If you want to change the actual optical angle of the scan it can also be done on the fly by changing the magnification selection in the scanner panel. Ball tracker: It enables image acquisition on a GigE camera to allow the tracking of the movement of the ball. This is done with a Dalsa Genie camera under infra-red illumination (the ball has a pattern that absorbs in the infrared to allow for tracking). The camera is synchronized to the frames of the microscope. Eye tracker: It enables image acquisition on a GigE camera to track the position and pupil size during the imaging session. This is again done by a Dalsa Genie camera. There is no need for infrared illumination as during imaging plenty of the laser light is scattered out of the pupil allowing for easy segmentation and tracking. Z-stack: Sets up the microscope to sequentially run imaging sessions at various steps. The data are stored in different files that are numbered sequentially. Optotune: Allows for control of the waveform in an optotune, electrically controlled lens, for continuous scanning in the Z axis without moving the servos. Network control: A network protocol allows other Matlab applications running on the network to control the microscope, such as setting parameters, starting and stopping acquisition, moving the position of the microscope and so on.